Greeting card entrepreneurs need a clear grasp on the basics of designing and creating a line that will sell. Know your audience. No one card line will appeal to everybody. Do you have a clear idea of who will be purchasing your line, and is it tailored to that buyer? If you are planning to focus on a college audience, for example, include lots of friendship and love cards, and more blanks than a regular mix, which will do better on campus. If your niche is the military, keep in mind that Get Well, Sympathy, Congratulations and Love/Miss You cards are big sellers to that group. Do some research first to find out if your idea for a card line will fly. If you only want to sell divorce/break up cards, for example, you are gearing your work way too narrowly, and have virtually no chance for success. Get clear on why you are creating your line and who would actually purchase your cards. Market research will help – get impartial opinions from others on whether they would consider buying your cards. Your mother’s opinion doesn’t count. Use the right format. 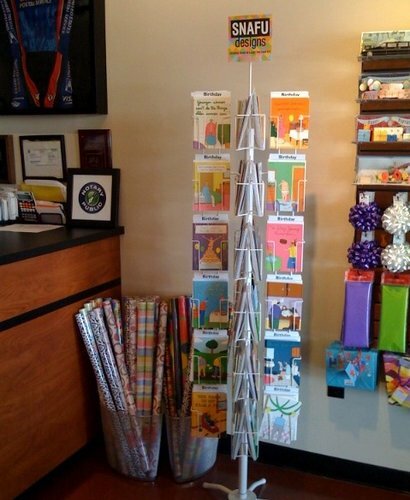 Most greeting cards are approximately 5” x 7”, which is a good size to stick with, as card racks can easily accommodate them. Cards which are designed in a “portrait” (vertical) format generally show better and sell better than cards designed in a “landscape” (horizontal) format. (This applies to “counter cards” in racks – horizontal is fine if you are selling packaged blank notes.) If you are selling to retailers, many will have “in-line” displays, such as that shown in the photo. This means that only the top few inches of the card will be showing, not the whole face. Keep this in mind when planning the layout on the front of your card to attract shopper’s attention. Your cards will be competing against many other cards, and it’s easy to get lost in the crowd if you don’t stand out. Design a big enough line. Some artists create a few cards and want to market them before they have enough critical mass to create an effective collection. My suggestion is to have 48 titles minimum. These cards should all work together visually to give the best impression. Greet your cards. If you are trying to sell a collection of blank cards, you are eliminating 90% of the market, who buy greeted cards. This is a pet peeve of mine. As a former card rep, I have seen way too many retailers refuse to even consider a new line of blanks. Greeted doesn’t just mean that “Happy Birthday” is written inside – it means that your message is well-written and appealing. If you simply can’t write greetings, get some professional help. It will be worth it in the long run. Balance your line correctly. This is a crucial consideration, and I go into the subject further in What You Didn’t Know About Starting a Greeting Card Line – Part 1. The number one bestselling sentiment is Birthday – this is 50% of your market. If your line is small, stick with the basic categories– Birthday, Friendship, Blank, Get Well, Sympathy, Thank You, Congratulations, Baby, Wedding and Anniversary. Less popular and sub-categories such as Bridal Shower, Retirement, New Home, I’m Sorry and Good Luck probably shouldn’t be in your line at all at first unless they fit into your targeted audience (see #1). I suggest not marketing holiday cards if you can’t commit to designing a whole collection of them. In my opinion, holiday cards should not be considered until after you have a good selling line of everyday cards established. However, if you have a target audience that demands it, go ahead – for example, the college consumer is very, very big on Valentines (but Christmas cards don’t sell, because the semester ends before the holiday). Update regularly to grow sales. This actually applies to any line of products you may design. Your customers want to see “what’s new” and you can create excitement and drive sales by updating your line several times a year. Communicate and promote your new designs through email newsletters, brochures, or even sending some free samples to your wholesale accounts. Updating also means that you are culling slow sellers from your line. If you have some real “losers”, don’t be tempted to add them into an order from a regular customer. A first-time order from a new customer should ideally be your bestsellers in every category. Hi Carolyn – thank you for all your ‘tips and wrinkles’! I think it’s particularly important to emphasise the fact that birthday cards comprise such a large percentage of sales and therefore, if time is at a premium, it’s worth spending more time and effort on those than say, Halloween or St David’s Day cards! As this is the internet so your readers will be global, I’d just like to make the point that ‘blank inside’ cards are the most popular in the UK. My problem is with printing firms, both local and online, being unwilling to print just a few cards of each design. Most want to print 50 of each design, so if you have 48 titles in your line, that’s a huge investment – and a lot of space taken up with stock! Do you have any advice on this side of things? Hi Judy, I agree that the UK does sell many more blanks than in the US, and almost wrote that in my article. It seems Americans just want to sign their name a little more than the Brits, who are actually willing to write a personal message!! Yes, it is difficult to work with printers on “short runs”, but here is my suggestion for that. If you are launching a line at a trade show or with reps, only make samples of each design. You will quickly find that there are designs which just don’t sell, and they can be eliminated, while your most popular cards can be printed. Thank you for your suggestion, Carolyn. If necessary due to your budget constraints, you could print samples yourself, if you have a way to make a high quality item – or you could print a couple through a print-on-demand website, which shouldn’t be expensive. Determine the demand for each design and then produce accordingly. I have done this many times myself although as an artist I didn’t make cards, but jewelry. I would take samples to a trade show, and then produce only those items which were ordered. Any that were very unpopular simply got discontinued. Thank you, Carolyn. I’m wondering whether I need to rethink my whole strategy, especially in light of your first point – ‘Know your audience’. I have been offering different types of designs to totally different types of outlets, ranging from the upmarket Art Shop to the bustling newsagents. This has inevitably meant getting relatively few of each design printed, which is turning out expensive! I’ll be adding the link to this post to my blog post about my experiences of selling through shops next week, if that’s OK with you? Of course, Judy feel free . . .
I’m not sure why you have different designs for different shops. Are their customers that disparate, or perhaps you have higher and lower pricepoints? I notice on your Greeting Card Universe store you have a very large number of cards available, but being a print-on-demand site, that is possible. You have lots of birthday cards which are age-specific. If that is causing your printing costs to soar, you might consider whether selling the card without the age printed on front might be more cost-effective. I see no reason why the card wouldn’t sell just as well. What is your experience with that? I really do appreciate the time and trouble you’re taking to help me, Carolyn. I hope your advice may be helpful to others too! Yes, the customers in the different shops are very disparate. The newsagents sell Welsh knick-knacks for the tourists, cheap stationery and, on the whole some very ‘cheap and nasty’ cards. They have chosen my Welsh dragon designs and pastel paintings and photographs of recognisable local views, in some case with a Welsh greeting or ‘Abergavenny’ in the greetings. The Art Shop and Gallery sells mostly ‘Art Cards’ and were only interested in my collages and possibly some of my non-local pastel paintings. And the gift shop chose what I call ‘pink and fluffy’ designs, cupcakes and pretty Valentine’s cards. The prices are the same but they cater for very different kinds of customers. As far as GCU is concerned, it seems that the more designs you have, the better your chances of sales – which suits me because I’m very prolific! The age-specific birthday cards are my best-sellers, along with ‘get well’ cards for very specific illnesses!I haven’t offered any of these to the local shops. I think you’ll get a better picture of what I’ve been doing when I publish a 2-part post on my experiences so far on my blog next week but your post has caused me to reconsider my whole strategy so I’m very grateful for that! Another excellent article, Carolyn! All of your points above are SO IMPORTANT! You bring a very important left-brain perspective to what many think is purely a right-brain process. Thanks, Don, that means a lot coming from an expert like yourself in this industry. You’re right that there is a mix of things that are important to making a line that is appealing, sells and grows. We have both seen lines from the big companies that fell flat, so we know how hard it can be to create the magic! I think I must have been storing up design ideas in my subconscious during all those years (more than 40!) while I was doing other things such as teaching, bringing up the family and voluntary work! And now they need to come out – hence the size of my line!! my retail card “decks” typically contain seven cards of each desired design. i have the ability to have multiple or different quotes within each design. one card out of the seven is left blank with no quote for the customer that wants to frame the card. if your designs and quotes are really well done…..the shop or gallery might display them in a unique place….away from the “mass of cards”…..preferably next to the cash register with your artist statement. be constantly aware of new quotes to use. instead of the typical “happy birthday”, use indirect quotes like “this is not just another day” or “each flower is a wish”……let the customer write “happy birthday” inside the card. look constantly for used card racks that you can control the placement of. retail shops have backrooms with card racks they are not using…..just ask if they have any cardracks not being used.i purchase pennies on the dollar, spraypaint black……good as new! as effective as a design originated as a 5×7 design and if that 5×7 design is really good it will interpret nicely to a larger giclee’ print on canvas or watercolor paper…….but that’s a story for another day! Tim, Thanks for your comment. I checked our your website and your botanical art is amazing! I appreciate your input – your suggestions are innovative and really useful! I enjoyed this reading! Such useful information! Is there a good source for good-to-deal-with online print shops and local names for this sort of thing? Hi Linda, Thanks for reading. I actually don’t know such a resource. I wonder if you might get some good input from joining greeting card related groups on LinkedIn. There are many people in the industry there who may have the answer! While I agree with what Don wrote about 99% perspiration, it’s beginning to seem to me that if one is operating completely alone, the sales side of selling through retail outlets could well take up 100% of one’s time and energy, squeezing out the designing altogether. Because the profit margin for the artist is so low, one would need to sell an awful lot of cards to make even a modest income – and that, combined with organising the printing, could easily become a full-time job. I agree with you, Judy – you have to have a system for making this work out profitably. Some artists license their work; others use sales reps, others only sell retail online, or go to trade shows and meet wholesale buyers that way. Minimum order requirements are helpful for getting large enough orders to make it work; selling outright causes fewer headaches than consignment. Pricing is key, and you have to be able to keep your costs under control. I just stumbled on your great site! It is filled with wonderful and useful information. I am at the beginning stages of starting a card business. I have a question regarding your mention of getting help if you simply can’t write greetings. I have basically three different styles of designs for my cards. One collection is a humorous line with sassy captions. I have a comedy writer friend who is writing the captions, and I am doing the artwork. We are baffled at how I should compensate her. I could pay her a set amount for each quote but I don’t have the $$$ up front to do that because I am already investing in a professional quality printer so I can print on demand (plus all of the other startup costs – accountant, taxes, etc. etc.). I could pay her a smaller amount per card for each one I print, and she is agreeable to that, but how much would that be? Any help you can give me on this would be greatly appreciated. I haven’t found any information anywhere that addresses this. Again, thanks for a great article. You’ve got me thinking that I need to go back and completely re-design all of my landscape oriented cards now. I had already been thinking that now that I’m in the process of designing a website. Hindsight is 20-20! Amy, I would hesitate to pay your writer friend on a “per sale” arrangement, unless she is your business partner. Some cards will sell, others will flop (it’s always the case.) I have no idea how large your line is, your marketing plan and so forth. If your friend is willing to do some writing to see what happens, then perhaps you can have a friendly agreement. But, if this is hard work and she expects a certain amount of compensation from you, and your business isn’t even launched, there are potential problems. I wouldn’t want you to lose a friend over a business arrangement. Carolyn, thanks for the quick reply. She is, indeed, willing to have a friendly agreement and see what happens. (We had already talked about that.) And for her, it’s easy. She can just whip out the snappy lines. It’s amazing. I, on the other hand, labor for days on a design. But I do want to be fair. Once I am selling the cards, and, like you say, some will flop, and hopefully some will sell, do you have a “best practices” suggestion for compensating her? Is there a standard for this? Maybe a percentage of sales of the cards with which she is involved? I just don’t even know where to start. I might add that one benefit to her is that I would promote her funny blog and books from my site. Thanks again. I was looking for answers about the greeting card industry when i ran across your site. The information here is helpful as well as the comments others have left. I have a card shop with Greeting Card Universe but I’ve only sold 9 cards. The rest of my sales have been family and friends. This has been for past six months plus. I advertise on facebook and youtube but i haven’t gotten any sales since the 9 customers. My target audience are women but with child appeal too. I also write in my cards. Presently I’m upset with GCU because they have taken months to approve my designs not weeks. I am losing potential sales because of it so I’ve a bought about 20 cards from another on line print service and opened an etsy shop yesterday with a few designs of embellished cards. One birthday and one friendship. http://www.etsy.com/shop/periwinkledust. I am trying so hard to stay positive and not give up but I don’t understand why my work doesn’t sell well? People tell me I am talented but at times I feel maybe I’m not talented enough. I haven’t tried direct sales where i approach a store in town to see if any one would carry my cards. I live on farm land so the internet seemed easier to start a card business, since I also have two children to care after but maybe I need to try direct sales too? My concern though if my designs are not selling on line would them being sold in an actual store make that much difference? Help! Sandy, Thanks for your comment. Greeting card entrepreneurs who make a living through sales of their work do wholesale, so that involves gaining store accounts. If i had thought about it before i had written you, I would’ve noticed my lack of every day greets in my card shop. I’m sorry for the repeat on your end. I do appreciate your help greatly and the two links were very useful knowledge. I will certainly work on adding more every day cards to my line of work, and i look forward to learning more on your blog about the greeting card business. I have not seen this aspect of selling greeting cards mentioned anywhere so maybe it will be helpful to others, too. (Sorry if you have mentioned it and I have simply missed it.) I am trying to calculate all of my potential costs up front, and this includes the cost of mailing any cards that might be purchased on my website. I would like to offer free shipping with a minimum order of ?? ?, and I assume people would not order as often if the cards took too long to arrive, so it can’t be “slow boat”. I am a bit in awe of the options out there and how to negotiate the various methods and prices. Is there some centralized place to compare? Do you have experience with this? How do people figure this out? The obvious choices are pretty expensive. Any pointers you might have to offer would be much appreciated. Thanks! Hi Amy, Yes the greeting card industry has a lot of details to it that can make or break your small business. If you are interested in a private business consultation, contact me at [email protected]. I do consulting for card entrepreneurs such as yourself, and many of my clients are in your business. Thanks for your comment, Mark. Telling you how to set up an entire company in a blog comment is not something that can be done (by anyone), but I would suggest that before you hire anyone, that you come up with a very clear concept of what you want to do, understand the customers you want to serve (and be extremely clear about this), set particular goals and make a business plan. Thank you very much, I will be reading your article again. I would enjoy having you check out my web site, when you find time. I would enjoy you telling me what I’m missing. I look forward to having your opinion. It all depends on greeting card audience. If it’s a city of obsession and an ego (Madison WI, Austin, TX, Seattle,WA) blank cards are the only real competitor. No sentiment really explains tourism. I think those who write greetings in Greeting Cards probably have low image quality and their cards image doesn’t have legs to stand in its own. My company is only blanks. I’ve grown 5 fold in 3 years with images that represent the character of the city, which is something you underestimate. 90%?! Well, you’re also in a very generic/very cheap office. You need cards that are super cheap in bulk. Sorry, but your statement is simply wrong – and ridiculous. One half of the cards sold in the marketplace are for birthdays; that’s a fact. I’m sure you wish that blanks were the biggest part of the business since that is all you sell, but let’s be realistic. Thank you for sharing all this information and the support and attention you give to all that comment. I wanted to ask about quotes. Is it legal or okay to use famous quotes (D.H. Lawrence) for example or general quotes that one may find on the internet? Dear Elyzabeth, Thanks for your question. You may use quotes that are in the “public domain” which means that they are no longer held under copyright, because the intellectual property rights have expired. It really is surprising to learn about all of the challenges that a potential greeting card company can face. I am especially interested in what you’ve said in tip number three about creating a big enough line. However, it does make a lot of sense that you would want to make sure you have a wide variety of greeting cards to offer your buyers before you put them on the market. That’s true, Arthur. There must be a “critical mass” which is big enough to make impact. A collection just won’t make sense, because you must have a dynamic presentation to incite sales.